At-The-Lake Lake Michigan Cape Cod Home with Sand Beach Access to Lake Mich. Check out our discounted weekly rates. We are located 5 minutes from Sturgeon Bay on Glidden Drive. this is the Lake Michigan shoreline with sand beach. We are across the road from the beach with 200' of deeded beach access. our home has 4 bedrooms. The master bedroom is a loft with a king size bed and has a balcony overlooking the living room and fireplace below. The main floor has a laundry room,full kitchen,living room,bathroom,and two bedrooms with queen size beds.The lower floor has another living room with cable tv,bathroom,and bedroom with a single bed. We also have a screen porch on the front of the house.On the back of the house we have a 10x10 deck with a gas grill.We also include linens and towels. If you prefer to bring your own that is fine. 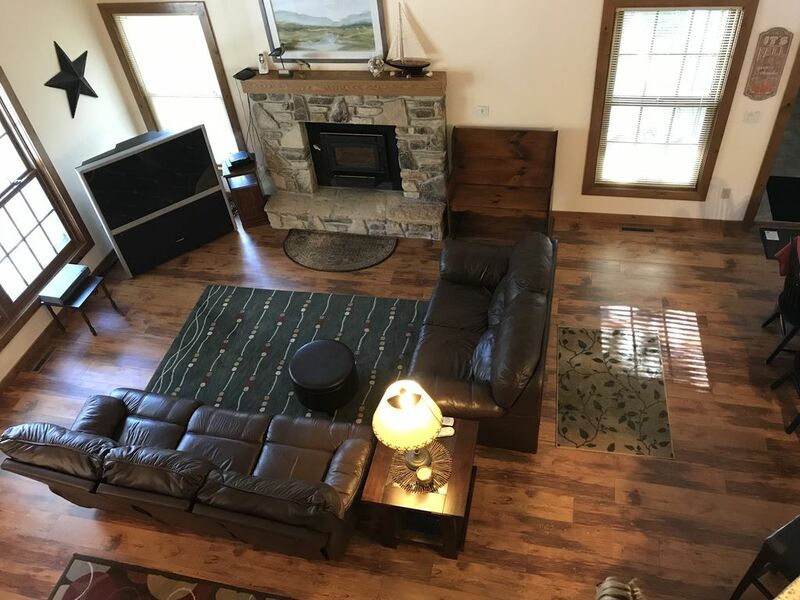 Glidden Drive is a place to get away and enjoy peace and quiet but is close enough to alot of activities in door county that you can drive to enjoy and come home to relax after a long day. We have great sunrises on the beach and you can enjoy walking over a mile on sand beach. Sorry we do not take pets. Keywords: Nestled in the pines on Glidden Drive 5 minutes from Sturgeon Bay. Enjoy comfort and beauty with Lake Michigan Beach access across the road. We are life time residents of Door County. We do our own cleaning and maintaining of the home to make sure everything is done as if we were staying there ourselves. We bought this rental in this location because this is where we would want to live ourselves. it is a private area and is very peaceful. You will enjoy bike riding on Glidden Drive and walking on the beach. there is a boat launch 1 mile away if you like fishing or just boating. The front of the house has a screened porch with a gathering area of patio furniture, complete with a table for 4. We provide you with the comforts of home, so that you can fully enjoy your Door County experience. Glidden Drive is peaceful and serene, and you can expect to see lots of wildlfe. We provide plenty of beach chairs for a day on the beach. Enjoy Day-Trips around the county and return to peace and relaxation, our guests tell us 'they have never slept so good'. We enjoyed our stay with extended family! The beach access was amazing. Quiet and beautiful surroundings. Highly recommend this home! My sisters and I try to get away each year for a sister weekend. This year we decided to make Door County our destination. It did not disappoint! This place was perfect for the five of us. It was spacious and yet very cozy. We fell in love with the layout of the house immediately and enjoyed relaxing in the lower level one of the nights, using the gas fireplace. We utilized both bathrooms in the house which was nice. We were all impressed with how well the kitchen was stocked. We left on Sunday and it came too soon for all of us. I got and looking for...relaxation, rejuvenation, laughter and a deeper love for this beautiful area. We would definitely return! Well maintained place that we enjoyed! Just like home but better!! This was the perfect place for our family girls weekend!! We enjoyed the seclusion but close to so many fun things! I’m amazed how I felt at home but didn’t feel like I was taking over someone else’s home! Would recommend this stay to anyone!! This is a BEAUTIFUL home, and we loved staying in it. You can hear the Lake from the house. The weather was perfect. Literally we went form downtown Sturgeon Bay (which is about a 15 minute drive; we did not have a car, there is ONE uber in the area, and we relied HEAVILY on 1 Awesome Cab Co.) and there was almost a 25 degree temperature difference. It was so cool I was able to run every single day. If you have a bike -- BRING IT! I wish I would've had one. The road is nicely paved. The only issue I have, is that the picture of the beach is deceiving. You are in fact about 500 ft. form the beach, however, there really is NOT much of a shore and it's overgrown with grass. It is also riddled with pebbles. We wound up just chilling at the house most of the time and were VERY happy with that; however, if you are going specifically for the beach -- there really isn't much. We are glad you enjoyed your stay. unfortunately this year the water level is about 2 feet higher then last year so quite a bit of the beach is under water. normally we do have a nice sand beach. hopefully next year the level will come back down to normal. thank you again for your input and kind words. our cancellation policy is a 60 day advanced cancellation is required to get a return of your deposit. inside of 60 days a full deposit is charged. if a medical emergency is the reason you are unable to come the deposit can be used for a different week that is available.